These days, we enjoy crunchy and delicious mac nuts as snacks, on salads, and even in desserts. It wasn’t always this way! Before Europeans arrived to the Hawaiian Islands and began farming and harvesting macadamia nuts, the aborigines of Australia had their own way of enjoying these nuts, which grew in the Great Dividing Range of Australia. The diets of indigenous people were plant-based and rather low in fat, so when these people were able to get their hands on some mac nuts, it was a real treat. The nuts take a lot of effort to collect and crack, so they were enjoyed in small quantities. They would be collected on the slopes of the Great Dividing Range, and carried down to the feasting grounds. Here, the indigenous Australians would crack the nuts open using two stones. One had an incision made for holding the nut; the smaller stone was used to for striking the nut. After the nuts were cracked, they would sometimes be enjoyed raw. Other times, they would be roasted in the fire. Some of the macadamia nuts of Australia, known as boombera, were more bitter than those that we eat today. For this reason, they were often ground into a pulp and washed with water before being eaten; this made them more palatable. Europeans discovered macadamia nuts in Australia in the mid 1800’s, and the director of the Botanical Gardens of Brisbane was the first person to cultivate the trees in 1858. 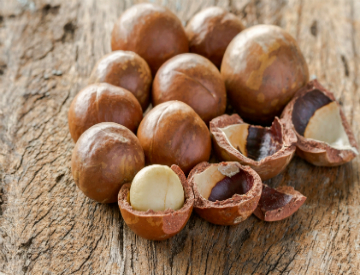 Soon, macadamia nut plantations were established in Hawaii, and the nuts slowly gained popularity, eventually becoming the quintessential Hawaiian snack that they are today. At Hawaii’s Local Buzz, we sell dehydrated mac nuts in a range of sweet and savory flavors. Visit our website to try these crunchy and delicious mac nuts for yourself!